Dr Nigel Wilhelm inspects a young oat plant. This is the message from South Australian Research and Development Institute farming systems leader Dr Nigel Wilhelm, who says growers should use leaf tests if they want to reliably detect micronutrient deficiencies. “It is not a good strategy to assume that there is only a deficiency if the classic visual symptoms are observed,” he says. Dr Wilhelm says growers should not underestimate the value of micronutrients. For example, at a trial at Cummins on SA’s Eyre Peninsula in 2015, copper applications increased wheat yield from 0.7 tonnes per hecatre to 3t/ha using early and late sulfate sprays. In the same trial, a single late spray of sulfate yielded 2t/ha. In the Cummins trial, despite the increases in yield due to copper applications, no visible signs of deficiency were observed. 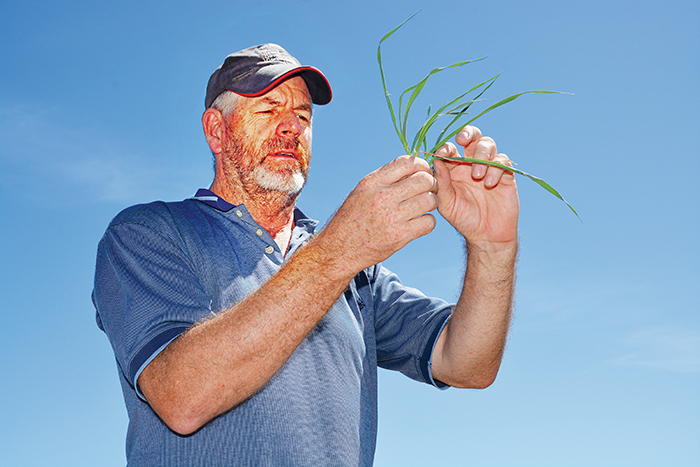 “The only reliable way to diagnose a deficiency is with a plant tissue test,” Dr Wilhelm says. “Soil tests are of little value for manganese and are, at best, only a guide for predicting zinc and copper deficiencies. Sampling young leaves at late tillering (GS30) is the best time to make a diagnosis. In most cases, growers will still have time to apply a treatment in the same season. A foliar spray of 250 to 350 grams of zinc (Zn)/ha at GS21 to GS30 can address a zinc deficiency in that year but will not provide any benefit in future years. Zinc-enriched fertilisers or a pre-sowing spray of zinc onto the soil are good options for that crop and for several following years, at a rate of about 1 kilogram of Zn/ha, or 2kg Zn/ha for a severe deficiency. Soil applications provide residual benefits in subsequent years and therefore can be more cost effective in the long run. Fluid zinc at seeding at a rate of 1kg Zn/ha can also be successful and provide residual benefits in subsequent years. Zinc seed dressings are effective and will supply zinc to the young crop but cannot completely overcome a severe deficiency, nor will they provide benefit in subsequent years. Foliar sprays of 75 to 100g/ha at GS50 can correct a Cu deficiency in the short term, and is a cheap option. An earlier spray at stem elongation (GS31) may also be necessary in severe deficiencies. Soil applications are the best method for long-term treatment, through applying copper-enriched fertilisers or fluid application at a rate of 2kg/ha. Severe deficiencies should be treated with manganese-enriched fertilisers banded with the seed (2 to 3kg manganese (Mn)/ha) or fluid application, as well as one to two follow-up sprays of 1.1kg Mn/ha from late tillering (GS30). Seed coatings are a cheaper option and may be used in conjunction with either enriched fertilisers and/or foliar sprays. No manganese applications have any residual benefits so must be repeated every year. Most vulnerable soil types: ironstone soils. Visible signs: tipping of the leaf, very rare to see and can be confused with frost. Note: many ironstone paddocks were treated about 50 years ago, and have not previously shown signs of deficiencies, but may now be running out of copper reserves. Most vulnerable soil types: calcareous soils, white siliceous sands. Most vulnerable crops: oats, barley and lupins. Visible signs: plants wilted for no obvious reason, pale stripes. Can present like Septoria in oats. Most vulnerable soil types: mallee soils. Most vulnerable crops: medics, durum and pulses. Visible signs: one to two stripes mid-way up the plant in cereals. No symptoms in pulses. Note: the soils and plant types listed here are only the most vulnerable. Deficiencies can occur in all crops and on all soil types. Read this article in GC South issue 122 - Subscribe and recieve the hard copy of GroundCover in your mailbox for free, remember to select 'Post' as your subscription method.